In 2007, we bought the property next door to us as a tenancy-in-common with a couple we had never met and their young daughter. Little did we know we’d be embarking on a life experience that would bloom into Fairytale Farm. 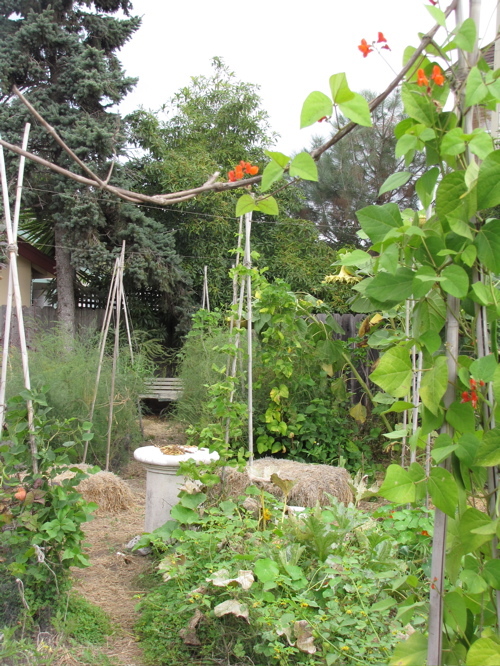 The two properties have become our little urban farm tucked away a few blocks from downtown Santa Cruz. The first year: weeds are slowly being replaced with peas. 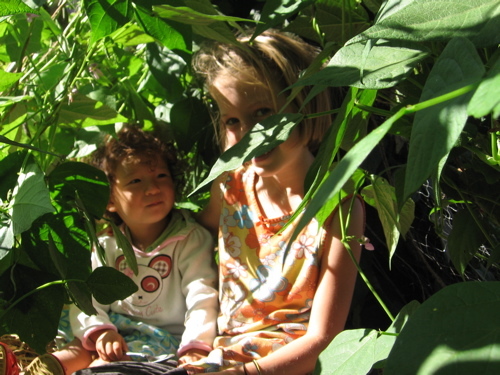 With the purchase of this property, our family became proud stewards of a very fertile piece of river soil. We promptly planted fruit trees, vegetables, and flowers, and by the summer, we wanted to share what we had learned from this beautiful space to the community. So Fairytale Farm was born, and we began hosting pop-up dinners featuring dishes from the garden. Pop-up cafes, classes on gardening, food preservation, fermenting, and drying began. We bought chicks, we put an empty beehive against the fence. A wild swarm moved in, we harvested honey. The chicks grew up, we had eggs to eat, and all was content at Fairytale Farm. The garden two years later. Our goal now is to be as self-sufficient as possible. We have solar on our house, laundry-to-landscape lines, and an extensive rainwater collection system. We started working with UCSC interns in the fall of 2014 to help expand the production of the garden. We are starting a neighborhood fruit tree project in 2015, where neighbors on the block will plant a different fruit tree with the intention of sharing with one another in the future. We imagine a future where this neighborhood is abundant with overflowing fruit and nut trees. Sometimes we still host dinners in the garden, sometimes we open the gates for Edible Garden Tours, sometimes we host small private musical concerts, Open Studios, or we can be found here simply hanging out. What better place to grow up than a bean fort? 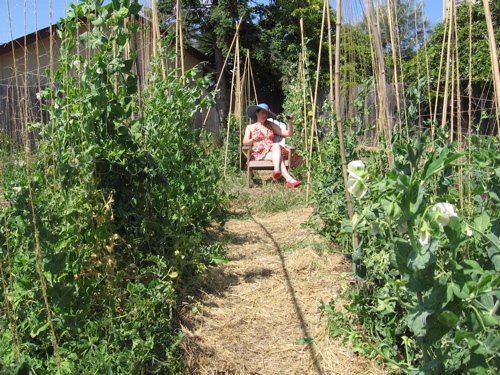 Most of all, we live, work, and eat in the garden. 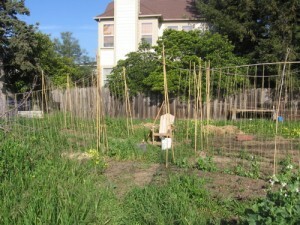 Though property is not affordable in Santa Cruz, and we had to buy this garden during the peak of housing prices,(so we’ll be paying it off for many years to come), I like to think it is worth it to keep it an open space and single family home. Preserving a little slice of heaven in the middle of the suburban jungle feels necessary. I like to inspire people that they too can grow their dream. I hope you come visit our little Fairytale Farm. Farm fresh eggs for breakfast are delicious! We haven’t yet been making enough eggs to keep ourselves supplied! (Which is a mystery we are working on, why 9 hens don’t lay enough eggs for us.) Once we get that solved, we may begin having extras. That”s sort-of how the urban farm goes; once you learn to grow enough for yourself, you suddenly have excess you want to sell or trade to others! The article above is wrong in several ways, I’m sad to say. I have 9 year old hens who still lay. If your hens stop laying at 2-3 years, you did something wrong. If you add oil to the diet, such as pumpkin seeds, they rarely will get a stuck egg. If an egg is too large to pass, an avian vet can perform surgery to save the bird. If you lower the protein content of the diet as the bird ages, that prevents eggs that are too large. 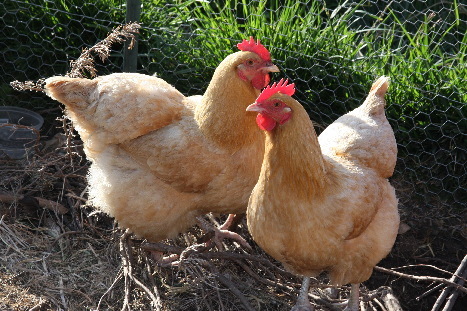 Hens need a break in the winter to continue laying healthy eggs, and they need lots of calcium. If you keep oyster shell out, research has shown that they can regulate their calcium on their own — I wish there was another supplement, but it appears that this is the one they can use to regulate their own calcium. They do need a special diet to stay healthy and produce eggs, so you have to know what you’re doing. Other birds don’t lay an egg most days like a chicken! That egg drains their vitamin, mineral, and protein stores. If you have pet chickens, there’s a local group that can help, the Santa Cruz Pet Poultry group. Find them online. if you put out a 4 seasons planting calendar, i’ll buy it! 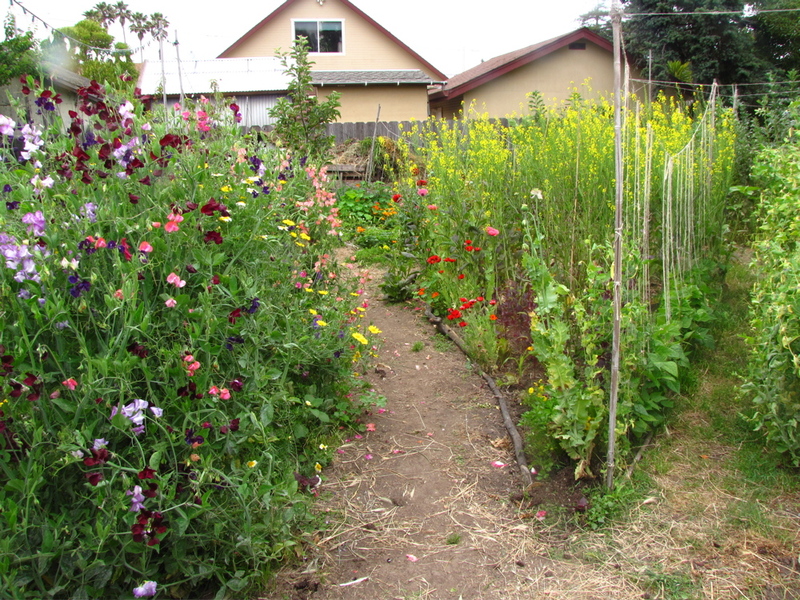 we are a bit south of watsonville and i am a gardener-in-process and i would love to have a calendar to help me decide when and what to plant in our climate. we too would like to be self-sufficient and we’ve bought a small greenhouse (6×8 for $300 from harbor freight) to help. I’m working on it! In the meantime, I highly recommend “Golden Gate Gardening”. It’s a book you can request from the library. I finally bought it. It has great information on gardening on the coast. Meant for San Francisco weather, so we do a bit better here!